This is a cut & paste from my LinkedIn account where I tend to publish my posts. However, given the topic I’d be interested in gathering views and thoughts. Question: What impact will UK’s Teaching Excellence Framework (TEF) have on Technology Enhanced Learning (TEL) in UK HEIs? A colleague of mine asked if I could provide some input on this question, and I said, “I’ve a three hour train ride home, so I’ll put the thinking hat on”. The following is the outcome of that long, lonely train ride home. As many in this area will know, there is no simple answer to this, and there no evidence to draw upon. Therefore, I’d love to read / hear what other people think will be the likely impact. Don’t hold back, get those comments flying …. Key take away: It will have a positive impact on the adoption of TEL, however, the determinants of effective adoption of TEL within an institution are varied. In the initial period, TEF will highlight the need for more effective embedding of TEL. I would strongly expect a number of institutions to use TEF as the driver to embed more effective TEL. The three core elements of TEF (NSS, Retention & Employability) are strongly influenced by the use TEL when combined with improved monitoring and intervention strategies. The impact of TEF on TEL is going to be very mixed, and we’d expect many institutions to undergo little change. However, there we will be a number where TEF will drive a re-think of the role of TEL, and TEL will become an enabler for improved TEF ratings. TEF provides a rationale and urgency for an institution to re-visit the effective use of TEL within its wider innovative teaching and learning agenda. The effective embedding of TEL within learning models has the potential to become a differentiator between institutions, and a provide the mechanism by which an institution can improve its TEF rating. For instance, the simple scenario of delivery of blended (flipped) learning to enhance large group, face to face teaching should improve NSS Assessment & Feedback ratings, and provide more real-time data to inform personal tutor and intervention strategies (positive impact on retention and attainment). Both of which will improve the core TEF components. In addition, a TEL focussed learning and teaching model will provide an easier mechanism for institutions to surface excellent practice to include within their Institutional statements. As stated there is likely to be a positive correlation between changing TEF performance and TEL adoption. However, institutional wide academic adoption of TEL is strongly influenced by a number of factors, including institutional culture, commitment, robust infrastructure, as well as academic and student support, development and engagement models. Therefore, for some institutions the likely impact on broad adoption of TEL will be low due to wider institutional barriers and challenges. The likelihood is institution’s will start to set clearer academic adoption KPIs (both in terms of level and type of adoption) to align with its emerging “teaching USP”, and be much more strategic in aligning its limited curriculum support and development resources (teams) to ensure maximum impact. Therefore, it is likely TEF will drive a re-think in how TEL is supported and developed within an institution. The institutional requirements for TEL are also likely to change over time in response to TEF. For instance, an emerging institutional requirement is the need to improve reporting and monitoring. This will enable institutions to identify opportunities to improve TEF performance through more proactive interventions. This is likely to follow a similar institutional response to the introduction of the National Student Survey. Where a consequence of introducing the NSS question set for final year students, has been most institutions now include the same questions within their internal surveys for pre-final year students, and depending on the outcomes, Departments may introduce action planning to improve the experience of the student cohort as they progress through the final year. The expected outcome is, improved NSS scores. This required institutions to implement more robust and standardized reporting and monitoring. The size of the impact will depend strongly on Senior Managers ability to drive institutional change towards decision making processes being more data informed in response to a need to align enhancement programmes, ie., curriculum redesign or better TEL support. The need for data decision making around TEF is likely to drive two related changes in TEL, firstly a consolidation on a core set of e-learning tools which will provide better quality data sets through more sophisticated data integrations and secondly improved reporting tools which can surface reports from the core e-learning tools. Will the impact of TEF on TEL be large and quick? I would expect not initially due the resistance to change being relatively high in the sector given the nature of its current implementation and relative immaturity (only on phase 2). I am not sensing a significant level of dissatisfaction by staff with the current situation and a strong business case and vision from the sector. The expectation is this will change as TEF becomes more established, and the rewards for a strong TEF rating start to emerge. The question “how can you drive Learning Analytics within your Institution” was the one I set myself to try to answer when I presented at the recent Gregynog Colloquium. The link to the slides illustrates how I tried to facilitate the audience to find an answer. The audience where IT Services staff from across various Welsh Higher Education Institutions. The approach was to (i) make them aware on the cross institutional nature of Learning Analytics, therefore all stakeholders have a role, (ii) touch on how we all are change agents, (iii) and provide some practical steps to promoting the change? As you’ll see from the slide deck, I drew upon a methodology we use to develop out use cases, and encouraged them to reflect on how their role fits within these use cases. The final step was to raise awareness of the factors which determine institutional readiness. As you maybe aware, Stephen Bryne and myself are presenting on “Optimising the Online Feedback and Grades Journey Experience” on Wednesday at the Blackboard TLC in Groningen. What is the Grade Journey? How will it help you achieve your strategic aims? What lessons can we learn when implementing Grade Journey? Given all our pressing priorities, why should the institution invest the resource and effort to implement an enhanced grade journey? Can you develop an elevator pitch to suggest … why? The intention of this post is to answer the question, what is the grade journey? This is the second post in a series which are based on our presentation at Blackboard’s Teaching and Learning Conference in Groningen. The short answer would be, the Grades Journey enables an institution to manage more effectively and efficiently the exchange of grades related data between Blackboard Learn and any Student Information System. Ensure there is a method of submitting coursework electronically through a single interface. Ability to either run all electronically submitted coursework through plagiarism detection (SafeAssign) or individual pieces of coursework or batches of coursework. Figure 1, illustrates the end to end process from the initial creation and publication of the assessment task driven by information within the Student Record System, to the pubication of the final grade from the Student Record System. Marks (grades) approval and release. There is flexibility in determining when you release grades and your approval process. These will align with your institutional approval workflows. There is flexibility to enable you to deploy a disaggregated approval process through role settings for authorized users. Automated grade exchange from Blackboard to your SIS, with the functionality to allow you to lockdown the grade centre as read only once the data has been synchronised. So, where might you start to think through how the grade journey applies within your institutional context? An important first step is to map out what you are currently doing, and who is responsible for the different parts of the grade journey end to end process. 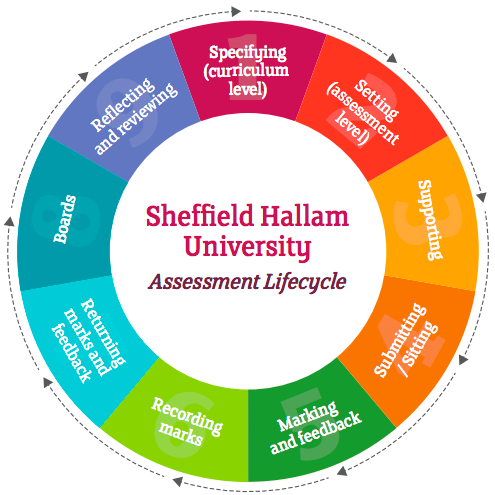 A good place to start is to work through the following visualisation (from Sheffield Hallam University), identifying what each section means within your institutional context, and who is responsible. I’m off to the Blackboard Teaching & Learning Conference (as you do), and I’m presenting on “optimizing the online feedback and grades journey experience”. As part of the positioning piece I thought it would be useful to share what I’ll be talking about around a Q&A. The first question is … how does the grade journey help you achieve your strategic goals? If we define the Grade Journey as an end to end process for enhancing the efficiency and effectiveness of exchanging grade related data between Blackboard Learn and their Student Information System. Then the question must be, how does this granular, strategic design focus map back to the institution achieving its Strategic aims? This can be answered through a number of different perspectives. Firstly, placing the Grade Journey within the broader context of an institution moving from vision and strategy to implementation. 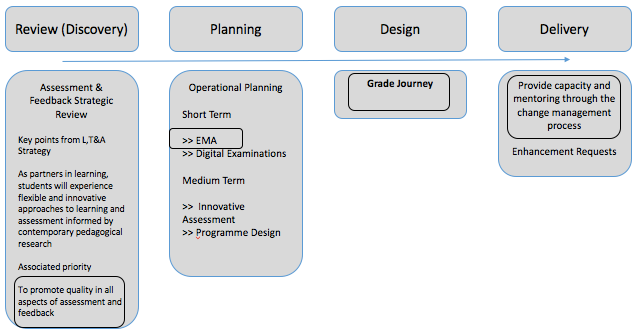 This is illustrated in Figure 1, with a potential process by which the institutional strategy is achieved through a Grade Journey project. If it is assumed an institutional assessment and feedback review identifies the following key requirement; “students will experience flexible and innovative approaches to learning and assessment informed by contemporary pedagogical practice”, with a priority being “to promote quality in all aspects of assessment and feedback” Through a Strategic Review and Planning engagement there are a number of short and medium term operational objectives identified to deliver these strategic requirements. One of these in the short term, is implementing a Grade Journey project as part of a wider electronic management of assessment change program. The next question is, in reality have significant efficiency gains been realized? The JISC EMA Programme identified there are, with significant potential resource savings (https://www.jisc.ac.uk/guides/electronic-assessment-management). At Queen’s University Belfast the School of English moved to e-submission and marking which saved 20 working days per year in administrative staff time (in a school with c.900 students). At the University of Huddersfield a time and motion study showed that an administrator dealing with 1,620 students saved 137 hours per year or 3.7 weeks based on a 37 hour working week. At the University of Dundee time saved through e-submission and e-tutoring works out at around 20 mins per assignment submitted. The centralised e-tutoring approach at the University of Dundee has also generated further efficiencies in that tutor time spent responding to emails is 60 minutes per week as opposed to 176 minutes on a similar programme that does not employ the system. The question to ask yourself is, what are your strategic goals around Assessment & Feedback, and how well do they align to the direct and indirect benefits associated with the Grade Journey? The intention of a later post is to answer; what is the grade journey? The following are a few notes I made when attending the JISC 5th Learning Analytics Network Meeting at UEL on the 3rd Feb.
Can you outline briefly the process you’ve gone through with each institution? The second deliverable is an indicative feature set and data improvement cycle. This is informed by the topic / theme. The aim is to give an indication of what the indicators might be, and the pilot design. How much similarity have you found across the institutions you’ve visited so far? The context >> I was expecting there to only be a view similarities across the five institutions because of different types of institutions (Russell Group, Post 1992), plus a very small sample. Overall what are the main areas which institutions need to tackle to move forward? Culture >> need to widen and deepen the conversation with staff – what is learning analytics? what does it look like? how can it improve learning an teaching at the institution? People >> capacity – looking at workflows for LA with interventions – this makes a very large, cross institutional project. So, all institutions undergoing significant change programs – so in the short term, capacity to handle more change. However, in longer term, links into culture and need to reduce resistance to change across all stakeholders. Proof of very strong correlation between attendance and average module marks.